OnePlus has been following a half-yearly cycle for a while now but the latest leaks associated with the OnePlus 7 suggest that this strategy could change in the coming months. OnePlus will launch two phones next month - a standard OnePlus 7 and the Pro version called the OnePlus 7 Pro. There are also rumours of the 5G phone, part of a separate product line, but that could come later in the second half of 2019. Recently, tipster Ishan Aggarwal posted a tweet with an image that seems to be a physical poster of the smartphone. "I'm pretty sure you all will soon see OP7 leaks flooding on your timelines since I can confirm that the launch is in May. It seems like the name of the more expensive smartphone is indeed gonna be OnePlus 7 Pro and tagline will be 'Go Beyond Speed'. Although, it may change." As per the leaks, OnePlus 7 pro will come with Qualcomm Snapdragon 855 SoC, 6.67-inch Super Optic AMOLED display, 8GB RAM and 256GB of inbuilt storage, Android 9.0 Pie out-of-the-box and a triple rear camera setup that will include 48-MP + 16-MP + 8-MP sensors. The Pro variant is also expected to come with curved display. Also, since the device is powered by the Qualcomm Snapdragon 855 processor, it also gives the phone 5G capabilities due to the presence of Qualcomm's X50 modem. 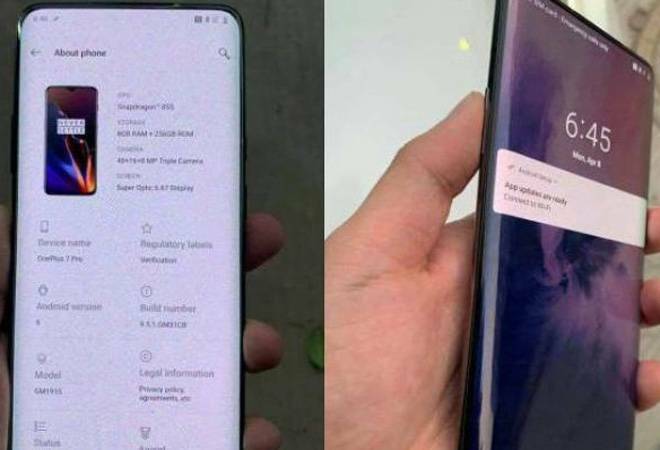 Separately, the leaked case renders of OnePlus 7 suggest that it would come with a selfie camera that would pop-up from the top left corner of the phone. Other than the pop-up selfie camera, the OnePlus 7 renders also revealed the three camera setup at the back, including a 48-megapixel Sony IMX586 sensor. The setup will be accompanied by an LED flash. OnePlus had joined the mainstream with its OnePlus 6T device and by launching a Pro and a regular version of OnePlus 7, the company is aiming to segment the market and take on Samsung Galaxy S10, Apple iPhone XS and Huawei P30 Pro.